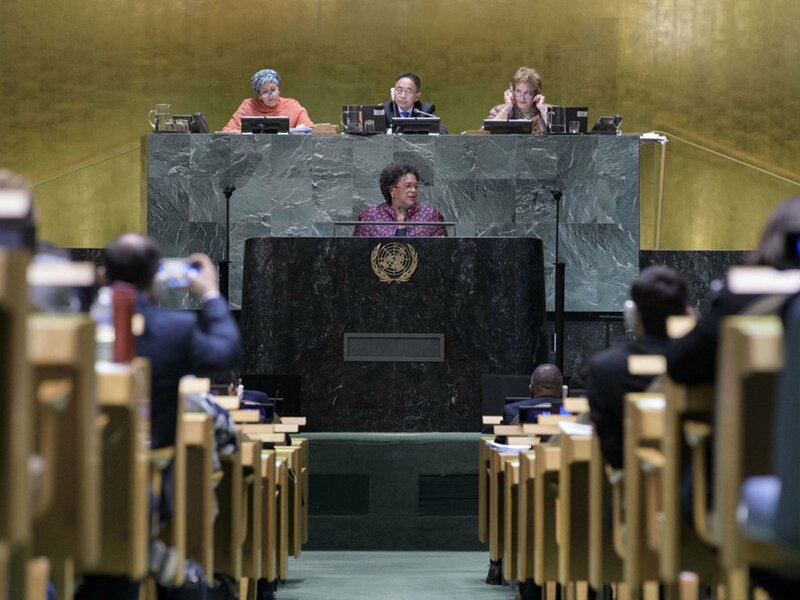 Prime Minister Mia Amor Mottley of Barbados addresses the seventy-third session of the United Nations General Assembly. From the Caribbean Sea to the Pacific and Indian Oceans, leaders from island States most threatened by global warming took the podium of the United Nations General Assembly on Friday, the fourth day of its annual general debate, to plead for increased aid to resolve a problem not of their making and call for reform of a financial quirk that punishes them for the progress they make. Island States have spoken on previous days, but on Friday a total of 10 island leaders took turns explaining to world Heads of State and Government not only the catastrophic impacts of climate change caused by centuries of industrial pollution from northern nations, but the disadvantages they face in the financial domain as soon as they improve the lot of their people. As soon as a country graduates from the status of low income country – or least developed country (LDC) in UN parlance – with an annual per capita gross national income (GNI) below $1,005, to middle-income country (MIC), with a GNI between $1,005 and $12,235, it loses access to concessionary financing, as St. Lucia’s Prime Minister Allen Michael Chastanet explained, noting the acronyms weighing down his Caribbean State. “I stand before you today as a leader of a small Island developing State – a SIDS, which is also a middle- income country – a MIC,’ he said. 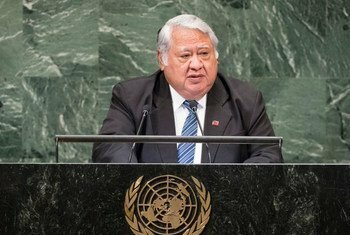 From the Pacific island nation of Samoa, Prime Minister Tuilaepa Sailele Malielegaoi, said it was a moral imperative for the world to act decisively and collectively, calling for full implementation of the Paris climate accord that seeks to keep the increase in global average temperature to well below 2 °C above pre-industrial levels. “Climate change poses the single greatest threat especially to small Island developing states like Samoa, not through our doing or choice,” he said, alluding to the fact those most vulnerable to climate change’s impact are those who contributed least to global warming. “The Pacific region is already facing the destructive impacts of climate change and disasters – cyclones, floods, droughts. Sea level rise and ocean acidification are taking their toll on the health and the wellbeing of our peoples, environment and economies. Disaster-related economic losses in Pacific island countries as a percentage of gross domestic product (GDP) are higher than almost anywhere else in the world,” he added. From the Indian Ocean, Prime Minister Pravind Kumar Jugnauth of Mauritius took a global view of the issue. “As we have seen in California, the Carolinas, the Philippines, China, Europe and elsewhere, the frequency of extreme weather events demonstrates that the impacts of climate change can affect every country on every continent. Hurricanes, floods, droughts, and wildfires are becoming deadlier,” he warned. Prime Minister Hubert A. Minnis of the Bahamas highlighted the enormous dangers facing the Caribbean islands, with economies dependent on tourism under dire threat. “We see this in rising sea levels, the loss of coral reefs, the increased volume of acid in our oceans, and more severe and frequent hurricanes and typhoons,” he said. “Tourism is the world’s largest industry. It is also the lifeblood of the Bahamian economy. Millions of tourists travel to the Bahamas annually because of our beautiful turquoise waters and biodiversity,” he added, stressing the vital importance of the sustainable use of the world’s seas and oceans free from pollution, especially of plastics. He too criticized the financial quirk that punished middle-income countries for their progress. “We reiterate our calls for the international community to address with urgency the sterile measure of per capita income now employed,” he said. Prime Minister Prime Minister Timothy Harris of Saint Kitts and Nevis addresses the seventy-third session of the United Nations General Assembly. It was a theme taken up by fellow Caribbean leader, Prime Minister Mia Amor Mottley of Barbados. “Barbados, the Caribbean and other small islands have had to confront the reality that our percentage in trade of goods and services is miniscule, but we are bound by the same rules that apply to those who dominate and can distort global trade,” she said. “Small States like mine were shepherded out of agriculture and told that services were the route we should use for development. My country, for example, tried financial services pursuant to double taxation treaties, utilizing due diligence, operating a clean jurisdiction that is not a tax haven and complying with Organisation for Economic Co-operation and Development (OECD) requirements. As if pre-planned to highlight climate change’s devastating effects, Tropical Storm Kirk churned past her country even as she addressed the Assembly, and she left UN Headquarters to return home. But before she departed, Mrs. Motley, the island nation’s first woman Prime Minister, used the podium to make a fervent appeal for recognition of women’s role in humanity’s progress. 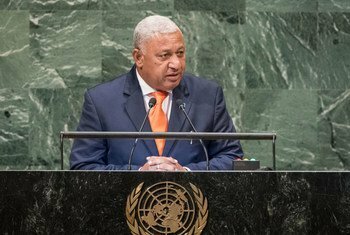 In the exponentially vaster Pacific region, Fijian Prime Minister Josaia Voreqe Bainimarama laid out the human toll. “I meet thousands of Fijian women, men and children every year who have suffered from the latest wave of climate-related impacts; the cyclones, the flooding, the prolonged droughts, and the steadily rising seas, he said. Fellow Pacific Islander, Prime Minister Charlot Salwai Tabimasmas of Vanuatu demanded that the industrial world step up to plate with the aid they pledged for climate mitigation. 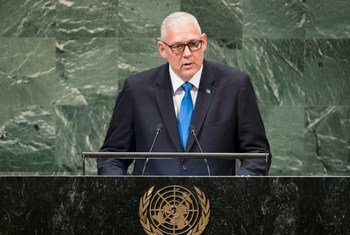 “The Governments of the industrialized countries promised to release $100 billion a year in climate funds for vulnerable countries by 2020,” he said. Solomon Islands Prime Minister Ricky Nelson Houenipwela also called for collective global leadership in climate change action and appropriate financial support. “Solomon Islands joins other Pacific island States in strongly urging the largest emitters of greenhouse gasses to take urgent actions in reducing this harmful emission. Reduce now or regret later,” he warned. Though their focus was on the potential climatic catastrophe looming over them, this is not to say that the island speakers ignored other world crises including conflict, security and development that figured in the speeches of scores of other world leaders who mounted the podium on day four.